Winners of the 2016 BBC Radio 2 Folk Award for ‘Best Original Track’, The Rheingans Sisters make bold, playful, innovative folk music that is anchored in traditions without ever being bound by them. Audiences across the world have been captivated by their performances, each one an authentic invitation to participate in an intuitive musical conversation between two musicians at the height of their powers. A life-time’s deep learning of European traditions is carefully re-imagined to produce beguiling new music. Older musical landscapes shape new songs, asking irresistible questions concerning our own lives. Always creating space for spontaneity and surprise, instrumental pieces are wholly contemporary while drawing from the well of musical knowledge passed down through generations. Their hotly anticipated third album is due for release in Spring 2018. 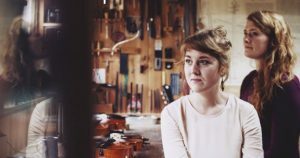 English folk scene as part of hugely popular BBC Folk Award nominated trio Lady Maisery as well as for her work with Nancy Kerr & The Sweet Visitor Band and the Songs of Separation super-group alongside Eliza Carthy and Karine Polwart. Anna lives and works as a fiddle player in Toulouse and is an expert in southern French folk music, having recently gained a 1st class diploma from the Conservatioire Occitan. As both sisters have also spent a significant amount of time studying fiddle music in Sweden and Norway, they pull a range of influences from both northern and southern European fiddle traditions into their own interpretations, compositions and arrangements.